That has been true in my experience, Thanksgiving is about who it is spent with. Whether it was the large family event I remember from growing up – we would have both sets of grandparents over, aunts uncles and cousins so many people that I had to eat in the hall way. Or when I went to seminary in California where I had no family whatsover, a family from the church I was attending invited me to join them for thanksgiving – welcoming me as one of the family. Or this year when it will most likely just be my wife and I eating the smallest turkey I can find at the grocery store as we wait for our first child to arrive. Thanksgiving has, for as long as I can remember, always been a holiday which is shared with family and friends. Its an opportunity to celebrate family traditions, remember where we have been over the years, and yes to give thanks. There are certainly many traditions which surround the feast. Whether its that you show up at grandma’s house at 3pm sharp; a specific food which must be present – for us it was devilled eggs; for some families it is the one time a year when grace is said around the table, gathered as a family; I’ve heard of some families which have everyone go around the table and say one thing they are thankful for. The repetion of these familiar traditions lead to the reciting of our shared memories: Remember the year mom forgot to cook the macaroni noodles before baking it? Remember that year we tried a country ham but didn’t know that it needed to be soaked in water? Remember that first year sister was able to fly home from out of state to join us for Thanksgiving dinner after so many years? We try to focus on the positive memories of the holiday, but the familiar rituals also bring to mind shared memories of unfortunate Thanksgivings. Remember the Thanksgiving day fire? Remember the first Thanksgiving after the folks split up? Remember the first Thanksgiving without grandma, grandad, mom or dad, without that one you loved? This year, for many, will be one of those un-Thanksgivings. There are people in this community who will spend this Thursday in the hospital, in pain, unemployed, underpaid,…alone. Yes, Thanksgiving is a mixture of sweet and bitter. For some it may seem that the only thing to be thankful for is that they aren’t the Thanksgiving turkey! This is what Thanksgivig is like in our scripture reading this evening. Thousands of years before the first Thanksgiving dinner as we know it, this scripture provides instructions for how to thank God for the inheritance of the promised land for the Israelites. They are to take the first fruits which the land produces and offer them to God. After the basket of produce is placed upon the altar, scripture provides words which are to be recited by the one making the offering. In just a few sentences this declaration recalls the history of the Israelite people. The history of the Israelite people recalled in this text is a mix of sweet and bitter. It almost sounds like our Thanksgiving remembrances: Remember Abraham the father of our faith? How he followed God out of his homeland to wander in a country not his own? Remember how he faced his trials and even betrayal by his best friend? But, do you remember how God made him into a great and powerful nation? God was really on our side then, we had great blessings. Remember the suffering in Egypt? The harsh labor, the misery, the toil, the oppression? Remember the delieverence? God’s power and might; his signs and wonders? It is in the light of this family history, the good and the bad, the sweet and the bitter, the joy and the pain, that thanksgiving is offered up to God. God was with the Israelite people through those years. He made them a great nation in Egypt, and he was pained when he saw his people harshly treated by the Egyptians. He rejoices with us in our Thanksgiving celebrations, and grieves with us when we have years of un-Thanksgiving. The command in the scripture for the Israelites is to give the first fruits to the Lord. The first fruits, not the best fruits, not the most expensive fruits, not the best tasting, but the first. I tried growing my first garden this year. Some local people told me I picked a really bad year to try to start gardening. It was just so dry and so hot, and then the difficult soil in the back yard. I cannot say that we exactly had a boutiful harvest. From our four pepper plants we got four peppers, total. Other plants did really well like the watermelon. It was certainly a mix. And God knows that. And that is why he asks for our first fruits, whether they are bountiful or sparse. Scott Macaulay offered his first fruits. Though it grew out from the pain of the divorce of his parents he offered this gift to others. Thanksgivings are always bitter sweet. I do hope you find joy in your Thanksgiving meal and family traditions this Thursday. 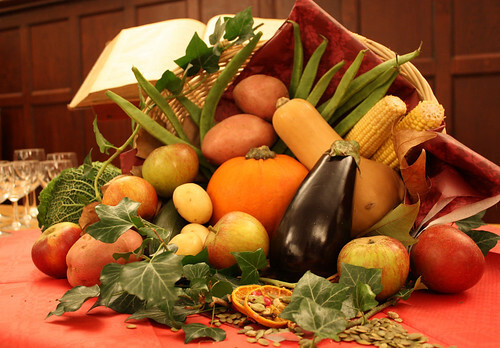 Whether you have bountiful blessings to offer thanks for, or if you are just thankful you don’t have to eat dehydrated-thermostabilized space food do remember to offer your first fruits to the God who is our source of blessing; our comforter even in un-Thanksgivings.